and high resistance to corrosion pitting as well as good general corrosion resistance in a wide variety of environments. Duplex stainless is the choice in extremely corrosive environments or were wear resistance and galling resistance is required. Many chemical environments not hospitable for standard 18-8 stainless is handled by Duplex stainless bolts. Duplex Stainless bolting handles nitric, hydrofluoric and phosphoric acids well at ambient temperatures. 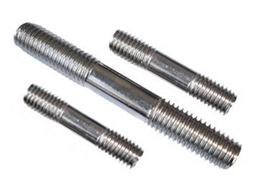 At elevated temperatures in chloride or sea water environments duplex stainless bolts have resistance to pitting and stress corrosion cracking superior to 316 stainless. Duplex stainless in various forms is used widely in heat exchangers, petroleum refining, offshore, petrochemical, pulp and paper industries. Duplex stainless in typical Annealed condition has an ultimate tensile strength of 105 ksi.